As a parent, your number one concern is always your child’s safety and comfort. As babies spend so much time in their cribs, you want to know that the mattress that they are sleeping on is safe, supportive and comfortable for your little one. Many mattress manufacturers use organic fibers like wool and cotton in their products. The U.S. Department of Agriculture’s National Organic Program (USDA-NOP) has issued a policy regarding proper labeling of these products, particularly in meeting USDA organic regulations. Organic fiber refers to natural fibers like cotton, flax, hemp, and wool that have been cultivated according to the national organic standards. This means no toxic substances, pesticides, and synthetic fertilizers as well as genetic engineering methods were applied during their cultivation, making them safe for your child. After researching dozens of crib mattresses labeled as organic, I have picked five of the best organic crib mattresses that you can find on the market today. These have third-party certifications, meet safety standards, and provide comfort, support and safety for your little one. 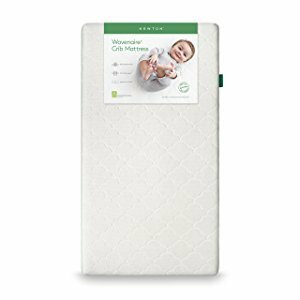 With a Greenguard certification, the Newton Wovenaire is truly an organic crib mattress. It fits all standard-sized crib, and measures 52″ x 28″ x 5.5”. This means that you can use it in the future for your other children or give it to another family if they need one. Babies can suffocate if they’re in a face-down position on a crib mattress, which is why experts recommend babies sleep on their backs instead. But the Newton mattress is 100% breathable, so it reduces the risk of suffocation in case of accidental face-down position. Your baby can breathe right through it, thanks to the 90% free air in the mattress’ core. Many parents tried it for themselves and found it to be true. This is a completely washable mattress allowing you to clean it in the case of accidental nappy leaks. You can wash both the fabric and the mattress; all you need to do is remove the cover fabric before washing it. What's Great About It: The Greenguard certification is an indication that it’s safe for babies. The soft yet firm surface provides a comfortable bed for infants and older babies, while also being hygienic and organic. With measurements of 52” x 28” x 5”, this Sealy mattress fits all standard cribs and toddler beds. The mattress also retains its original thickness even after years of use, and can easily accommodate a baby up to 60 pounds. The secret to its longevity and durability lies in the use of high-density soybean foam for its core. The combination of foam and soybeans provides the right balance between comfort and support. It doesn’t contain toxic substances that pediatricians say must not be in crib mattresses. These include phthalates, formaldehyde, and heavy metals such as lead and mercury. A quick look into the mattress’ layers will reveal that it has a waterproof surface. This protects the foam core from stain-causing liquids. The less the liquids in the foam, the less risk of mold and mildew growth, the safer your baby will be. When liquid accidents happen, the mattress’ surface can be spot-cleaned. Be sure to remove the stain as soon as it happens so that it doesn’t become permanent. What's Great About It: The mattress has so many organic-related certifications, such as the CertiPUR, Greenguard Gold, Oeko-Tex, and ASTM. At just 9 pounds, it can be easily lifted out of the crib for cleaning purposes. 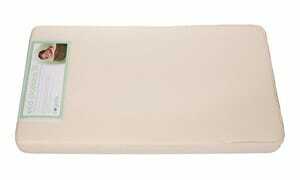 Its square corner design ensures a tighter fit, which is a must for safety in crib mattresses. The waterproof covering and seams of this mattress are made with polyethylene, a substance that meets strict food-grade standards, immediately catches attention. It prevents liquid accidents from entering the mattress layer. It’s also non-toxic and provides a protective layer against bed bugs and dust mites. It can be wiped clean with a damp cloth to remove the spills and stains. It may also be disinfected with 70% alcohol and left to air dry before use. The filling is certified organic with its 100% organic cotton cultivated in compliance with the USDA guidelines. There are no toxic substances and chemicals used in its production. Babies who sleep on this mattress will not be exposed to these harmful substances that can cause respiratory illnesses. The mattress grows with the baby as it’s a two-stage mattress. Just flip the mattress over depending on your baby’s age. The firmer side is for an infant since they requires more support and the softer side for a toddler due to their increased comfort needs. Getting more value for the money is possible with this mattress because it can be used until a child is five years old by transferring it to their toddler bed. What's Great About It: The mattress is organic inside and out, thanks to the use of 100% certified organic cotton for its inner filling and outer fabric. Naturepedic offers a lifetime warranty on it, and is a trustworthy mattress manufacturer with great customer service. While a stylish and sleek appearance may not be important for a baby, it may be for the parents, which is why the Colgate Eco Classica III is popular – for its attractive design. There’s more to its appearance as it offers dual firmness for infants and toddlers just like the Naturepedic No Compromise mattress. During a baby’s infant stages, they will need more comfort from a firmer mattress. This will also strengthen their muscles and allow them to breathe properly. They can also push up more easily on a firm mattress than on a softer one. When they become toddlers, they prefer the softer side of the Classica III. Toddlers love the greater comfort that a softer surface provides, especially for their developing bodies. The 6-inch crib mattress is also thick enough to last for several years, usually until your child outgrows their toddler bed. Be sure to rotate the mattress to ensure even wear all around. Mattress rotation is a must even for crib mattresses. An infant sleeping on a mattress with a sagging center may experience the negative effects on their bone development, especially in their spine. What's Great About It: The high-quality foam combined with its waterproof cover makes it easy on your baby’s body. There are no petroleum-based oils, flammable chemicals, and other toxic substances in it as evidenced by the CertiPUR-US and Greenguard certifications. 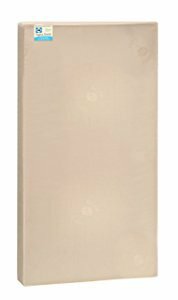 Colgate is also known for being a reliable crib mattress manufacturer with its organic line being among the most dependable. 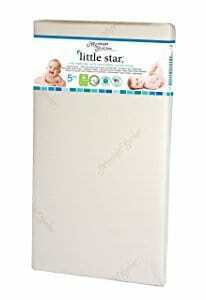 The Little Star is just 5” thick, but it’s just as good at providing the necessary comfort and support parents want in their babies’ crib mattresses. The high-density foam can last for several years from your child’s infancy to his toddler years provided that proper care is adopted. Just be sure to remove stains and spills as soon as possible and rotate the mattress regularly. There are also two layers in the mattress. First, the infant-suitable layer consisting of extra-firm foam made with plant oils. Second, the toddler side consists of synthetic latex foam, which has the right softness, as well as antibacterial properties. Cleaning up the mattress and changing the bedding is also easy. The seams are sewn flat against the side. The mattress is also relatively lightweight so cleaning it is easier on your back. The cover can also be washed in the washing machine when necessary. What's Great About It: Even when the cover is removed for washing purposes, it can still be used immediately because of its inner core cover. This is made of performance fabric that’s safe on the skin. The high resistance against stains, spills and odors is also a plus. While a crib mattress may seem like a small thing, its importance to your baby’s safety cannot be overemphasized. Keep in mind that your baby will spend up to 18 hours a day sleeping in their crib. The safer their mattress is, the better their overall development can be. So when I made my choices in the best organic crib mattresses, I had to carefully consider the numerous characteristics that these should have before I recommended them. Second, there should be no PVC’s with phthalates and PBDE, to name a few, because these aren’t safe for your baby, especially when inhaled or ingested. These substances increase the risk of a wide range of health issues, such as developmental delays and immune system suppression. Third, the mattress should fit snugly in the crib. There should be no gaps between the mattress and the crib’s rails. Otherwise, a baby’s arms and legs can become trapped in these gaps, no matter how small these may be. To check, insert two of your fingers into the space between the mattress and the rails. If you can insert them easily, then it is not a snug fit. Buy a well-fitting mattress to ensure the child’s safety while inside the crib. Fourth, the foam mattress should be firm enough for an infant not to suffocate if he accidentally rolls over. The dangers of a soft mattress for infants cannot be underestimated considering the higher risk of sudden infant death syndrome (SIDS) that come with it. Between a foam and innerspring mattress, I agree with baby safety experts about foam mattresses being the better option because of their non-trampoline like nature. 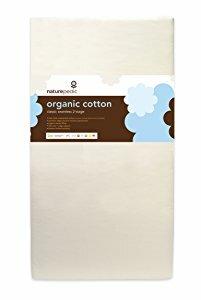 Most importantly, always look for quality organic crib mattresses. While hand-me-downs may seem like a good idea, it isn’t when you consider the issues that come with them, such as sagging in several places. The best organic crib mattress should provide your little one with the right balance between comfort and support, just as you would want for your own mattress. But since babies face certain risks while in their crib, there are also other considerations that parents must take into account.